Never being one to sit still Joe and his long-term writing partner Nick Smith at it again getting ready for a new release. The Black Sorrows continue to be one of Australia’s most enduring touring bands and a festival favourite. Membership in The Black Sorrows has always been loose and fluid with Camilleri being the only constant. In keeping with Joe’s desire to continually move forward, the latest incarnation of The Black Sorrows is – Claude Carranza (guitar/vocals), Mark Gray (bass/vocals), John McAll (keyboards/vocals) and Angus Burchall (drums). In 2014 Joe Camilleri celebrated 50 years in the music business. The release of the highly acclaimed album Certified Blue added to the 50th celebrations by giving him his first mainstream chart appearance in almost a decade. Certified Blue peaked at #2 in the ARIA Jazz and Blues Chart and remained in the chart for over 40 weeks. 2015 saw the band tour Scandinavia for the first time in twenty years in support of the release of ARIA nominated album Endless Sleep. Europe is now permanently on the touring agenda. 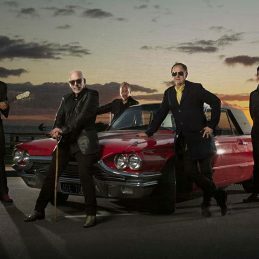 Camilleri launched The Black Sorrows, a loose band of like-minded musicians, in 1984 following the demise of his seminal band Jo Jo Zep and The Falcons the year before. From humble beginnings playing inner-city cafes around Melbourne and selling albums from the boot of a car, Camilleri transformed the band into one of the most sophisticated ensembles in the country. The independently released album Dear Children, represented a turning point once CBS/Sony stepped in with a world-wide deal. When radio picked up the classic track, Mystified, The Black Sorrows really took flight releasing multi-platinum sellers Hold On To Me, Harley & Rose and The Chosen Ones. The Black Sorrows have won the ARIA for Best Band, played sell-out shows across Europe and sold more than two million albums worldwide. Writer of milestone Australian songs such as So Young, Hit And Run, Shape I’m In, Hold On To Me, Harley and Rose, Chained To The Wheel, Never Let Me Go and the Chosen Ones, Joe Camilleri’s music has become part of Australian music culture. As a member of Jo Jo Zep and The Falcons, Joe was inducted into the ARIA Hall of Fame in 2007. Camilleri has shown fans and critics alike that he is a performer with an undeniable energy and love of it all.